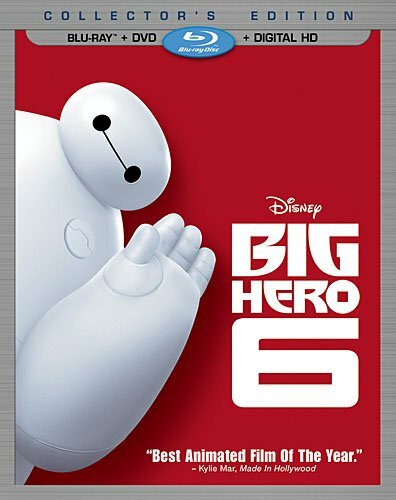 Fresh off winning the Oscar for Best Animated Feature, Disney is releasing Big Hero 6 on Blu-ray today. Following teenaged robotics genius Hiro Hamada (Ryan Potter) and his huggable health care companion Baymax (Scott Adsit), this is a beautifully animated film that mixes a superhero origin story with poignant themes of grief and letting go. For these reasons alone, it deserves the Oscar. Watching Big Hero 6 again, it’s amazing how flawlessly the film and characters all come together, delivering big entertainment with breakneck pacing that allows for both exciting action sequences, and some genuinely moving moments between Hiro and Baymax. My full review is right here. The Blu-ray includes two featurettes and several deleted scenes, all worth seeing. There’s also the Oscar-winning short film Feast, a lovely animated piece that tells a charming story through the meals shared between a dog and his owner. Big Hero 6 is 102 minutes and rated PG.